Water. The human body is over 70 % water. The average adult contains 1013 gallons of water. Blood is 83% water, muscles 75%, brain 75%, heart 75%, bones 22%, lungs 86%, kidneys 83% and eyes 95%. It is a wonder we dont slosh when we move. Water is important to health because it improves oxygen delivery to the cells, it transports nutrients, it hydrates the cells, it makes breathing easier, it cushions bones and joints, it helps regulate body temperature, it removes wastes, it lubricates joints, and it maintains normal electrical properties of the cells. 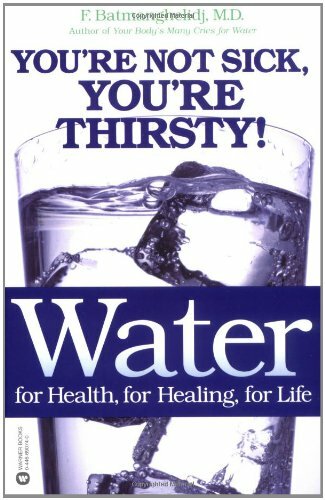 There are 2 kinds of water in the body: intracellular and extracellular  meaning inside the cells and outside the cells. Good health is a function of the balance between the 2 kinds of water. This is partly controlled by the levels of potassium and sodium in the diet. Salt or sodium helps us to hold on to fluid, but if there is not enough potassium to draw the water into the cells, then dehydration at a cellular level results. This form of dehydration is common in America due to the excess amounts of salt intake. It is important not only to increase potassium intake, but to decrease salt intake so that the proper ratios for the body are maintained. Many health problems have dehydration as a component. These include allergies, asthma, hypertension, constipation, cholesterol, premature aging, Alzheimers, back pain, migraine headaches, obesity and depression. Studies show that the average American drinks only 4.6 glasses of water per day. Almost 10 percent of Americans drink no water at all. The average American also drinks 4.9 glasses of dehydrating beverages such as coffee and tea per day. In terms of hydration, you need to drink 1 glass of water for each beverage containing caffeine that you drink just to remain neutral. This means that the average American is dehydrated since they would have to drink 12.9 glasses of water per day to overcome the effects of the dehydrating beverages plus get their recommended 8 glasses. Statistical studies on cancer patients show that most cancer patients do not drink enough water. Studies also show that women who drink at least 5 glasses of water per day actually reduce their chances of getting kidney and bladder cancer by 45 percent. Five glasses per day or more reduces the chance of getting prostate and testicle cancer by 32 percent. To get adequate water into the body, drink at least 8 eight-ounce glasses per day. If the water contains coffee or tea or soda or juice, it does not count in the eight-ounce daily requirement. For each glass of coffee and tea that you drink, you need to drink an additional glass of water to offset the dehydrating effects of the caffeine. Previous article by Margaret Durst: Want To Be in a Better Mood?